Pasta will make me fat. Consuming more calories than your body can burn is the typical cause weight gain - not pasta. However, since one 2 oz. serving of our pasta only adds up to 200 calories, you can enjoy a pasta dinner without worrying about your waistline. Now that I am eating healthy, I should avoid carbs. Carbs are a primary fuel source for your body, making them an important part of a well-balanced food plan. According to the USDA, carbohydrates should provide 45% to 65% of your daily calories. And, when you combine pasta with other healthy foods like veggies, tomatoes and lean meat, you get a nutritionally balanced, wholesome meal that provides many essential nutrients like fiber, protein, vitamins and minerals. Download the USDA Dietary Guidelines PDF. Pasta tastes great, but has no nutritional value. It's quite the contrary. pasta is a source of several essential nutrients, including iron, folic acid and several B-vitamins. Some pastas are also enriched to provide an extra nutritional punch. For example, Ronzoni® Smart Taste® pasta tastes just like regular pasta, but has 2.5 times the fiber and is an excellent source of calcium and vitamin D.
Getting enough fiber in my diet is hard and pasta can't help me. Fiber is easy if you add some pasta! Regular pasta has 2g. of fiber in every serving to help you meet your daily requirement. 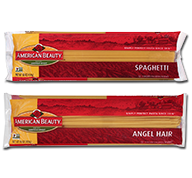 Some pastas have even more, such as Ronzoni® Healthy Harvest® 100% Whole Grain Pasta which has 5g. of fiber per serving. Pasta gives your body, especially your brain, the energy it needs to run. As a carb, pasta gets broken down slowly into glucose, which is a primary fuel source for the whole body and is the key energy source for the brain (which uses six grams hourly on average). Therefore, pasta is a smart meal choice in more ways than one. Pasta will give me quick energy and then I'll crash later. Some carbohydrates cause a spike in blood sugar that later can make you crash. However, not all carbs are created equally. The National Institute of Medicine supports the research behind the glycemic index, which rates carbohydrates based on how quickly they break down in your body. Pasta has a low glycemic index, meaning it breaks down slowly in your body to help maintain a normal blood sugar level and has a more lasting effect on energy levels. Pasta is white because it is made from bleached flour. "White" pastas are actually made from a blend of semolina and durum flour, both of which are unbleached. Under Italian law, dry pasta can only be made from these two flours. All of our pastas in America adhere to this law. A 'sensible' portion of pasta can keep me full. Whole grain pasta in particular, because of its high levels of fiber, can help you stay full for longer periods of time. Ronzoni® Healthy Harvest® specifically, has 5g. of fiber per serving. The fiber helps prevent those peaks and valleys in blood sugar levels that can cause cravings and poor food choices.